The FTD Eternal Rest Standing Heart bursts with love and sweet comfort to honor the deceased at their final farewell service. 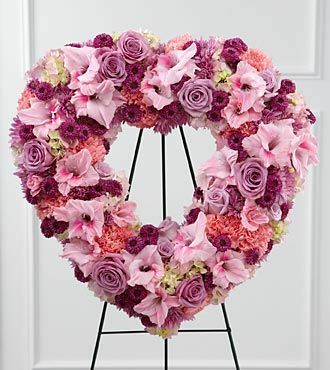 Lavender roses, pink carnations, purple button poms, lavender chrysanthemums, pink gladiolus and pink hydrangea are beautifully arranged in the shape of a heart and displayed on a wire easel to create a stunning display of warm affection that will last in the hearts of friends and family for years to come. Approximately 22-inches in diameter.